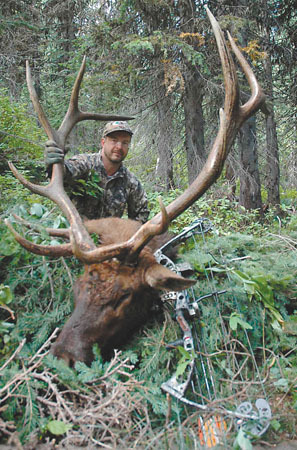 Bowhunting World''s Mike Strandlund heads to Idaho''s Selway Wilderness to chase monster elk. On the sixth day of my Idaho wilderness bowhunt for elk, we arose at 3 to ride horseback in pitch black high into the craggy Bitterroots beyond our tent camp. In the day's first slanting rays we tied our rides and bushwhacked it, Wade and Bobby and me. Much of the alder and willow undergrowth was impenetrable but we fought through it toward some elk spotted and a bugle heard on the edge of the timber high above. The steep grade and thick brush slowed our pace such that by the time we reached their loitering bench the elk were gone. We worked the mountainside all morning, setting up here, calling there, master guide Wade Planer working strategy and his bugle with intensity. We even managed to coax a 5-point halfway in. But it was early in the season and the bulls were aloof. We broke for lunch, loafing in the pine duff gulping sandwiches and apples and water, talking about hunting, and the country, and the bull Bobby'd bagged almost a week ago already. Then it came to us, a sound on the edge of perception, so faint you weren't sure you really heard something...but yes, the distant wail of wapiti. So we're up and off in that direction, encouraged by a bull motivated to sound off in midday. We move in and set up and Wade calls and gets a roar in response, bringing waves of excitement and anxiety over us. In only a minute the bull bugles again, obviously closer. He's coming in! I scramble for better position and find a rare shooting lane in the form of a game trail through the thick stuff. I visualize the elk pitching down the mountainside, pausing in the trail to the sound of my timely calf bawl, presenting a broadside shot. But I'm wrong. I catch a flash of tawny hide, then mahogany antlers; he's already circled and is coming—straight at me on the game trail! He's coming fast and at 25 yards he passes behind a small pine as I draw and in half an instant judge his massive rack a keeper. Now it's a matter of not blowing it, letting him come until he spots the quivering blob in the trail and pauses to consider it, which he does at 18 yards. I find my spot and let fly. The bull instantly charges—straight down the trail, straight at me. I'd gotten into this predicament innocently enough. After hearing stories for years about the beauty and gamerichness of Idaho's Clearwater region, I resolved to experience it, and inquired with the area's top guide. Tim Craig runs Boulder Creek Outfitters and has become something of a legend through the many TV shows and magazine articles that have showcased his abilities to match bowhunters and quality elk, mule deer, whitetails, black bear and mountain lion. Tim outfits on a boundless variety of property, ranging from ranches he owns and leases to wilderness pack-in camps. Since a good-sized elk herd was inhabiting his ranch just outside the town of Peck, and that ground also offered a good shot at a big whitetail or muley as well, I opted to hunt elk and deer there. The ranch house sits in a pretty little creek valley between hills of rangeland to the east and timber to the west. Generally the elk gravitate to the timber, the muleys to the open country and the whitetails to the brushy pockets and drainages of the area. We hunted all three over several days and spotted some fine animals, but it just wasn't coming together. The elk were getting more difficult to get onto and deer patterns kept changing. Reports had come in that hunters were onto elk in Tim's wilderness camp in the Selway-Bitterroot Wilderness a hundred miles east. It was time to make a decision I couldn't pass on a chance at such adventure and headed eagerly to the Selway, a vertical forest of pine and fir and rock and fur I've read and dreamed about for years. It started with an awesome hour-long bushplane flight to an airstrip deep in the wilderness. There, a classic camp of canvas wall tents had been set up and horses awaited. I shared a tent with a pair of fine and fun Texan hunters, Dean and Bobby. Bobby had bagged a bull his first evening in camp, so Dean and I hunted together several days with Nick, a young guide who splits his time between the mountains of Idaho and beaches of Hawaii. We'd arise before first light and ride horses out from camp in the dark, listening for bugles and glassing for elk hide. We got into a few elk but it was the first week in September and the rut was just starting to roll. A few days into our quest it became obvious our chances would be better split up so while Dean and Nick headed back down the valley, I headed up with Wade, and Bobby came along to share in the adventure. 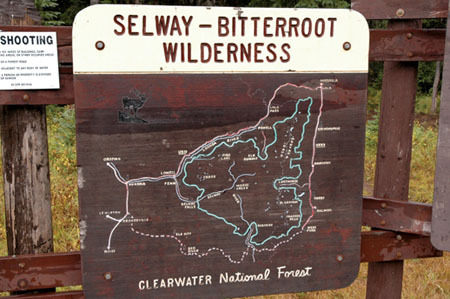 We rode and walked hard, penetrating far deeper into the wilderness than we had before. Then, just as we were being lulled into a mellow wilderness rhythm, our world burst with excitement. Our efforts had paid off with a bull in my lap. Do you know how it feels to be charged from point blank by 700 pounds of dagger-tined horn and adrenaline-charged muscle? It doesn't feel like anything because you don't have time to feel, or think, you simply react, diving for cover and hoping the raging bull doesn't correct his course and even the score. In honesty he did veer—the other way—when he saw me leap aside. I stood quickly and craned for a good view, trying to track his path. But it was a short one. In seconds I saw hooves in the air. That's when the feeling hit and with fast, shallow breaths and wobbly knees I made my way to where he lie. He was a beauty. We would find later that the arrow had penetrated just right of the bull's sternum, and entered the elk's body completely, a full three feet of devastating penetration. We discovered the arrow there when we caped and cut up the bull, packing him out on a pair of mules we brought in the next morning. That's one of my fondest memories of the trip, riding that packstring out through cool timber and sunny meadows, taking in the view of the mountain scenery and my elk rack on a mule's back, thankful for such a glorious experience and eager to return. Among the West's biggest and most successful outfitters, Boulder Creek offers bowhunting exciting in variety and quality. Tim Craig is not only very knowledgeable about the area's game and hunting techniques, he's also the world's friendliest guy. It's important to him that he and his clients have fun along the way to accomplishing their hunting objectives. I got to sample two very different approaches to hunting and it’s a tough call to say which I preferred. For several days I stayed at Tim's Lodge in Peck and hunted ranch elk and deer. It was a pretty easy bowhunt, employing ATVs and treestands and the comforts of the lodge. Then I hit the wilderness with its many challenges and grueling 18-hour days of horsebacking and hoofing it. OK, so I admit, I'm a wilderness kind of guy. Along with deer and elk, hunters interested in bear can get a real good crack at one in the wilderness hunt. Tim is also a major lion hunter. For more info, call (208) 486-6232; Boulder Creek Outfitters.